It's always best to jump into the preorder fray already knowing what you're looking for. To help you make a game plan for the Ace & Jig preorder action going down tonight, here's a crash course on the SS17 Drop 4 textiles. Incidentally, I have seen all of these in person already, thanks to various Barneys XOs and kimonos. See below for the official info from Ace & Jig, plus reviews based on my personal experience of the textiles. navy, maroon, and mustard. As seen on the yoke of the Barneys XO Bronte Dress in Dune and the Kimono in Dune. Description: Ivy is arguably two-sided. One side is more of a natural/cream color, with a palette reminiscent of Antique Gauze from SS12. and the other side (as seen above) is a lovely light periwinkle blue. My Thoughts: This is my favorite textile of the 4th drop. I would say that the weight and feel is similar to Dune. It has a lovely texture and mostly seems pretty sturdy. The colorful contrast threads, however, seem like they be a bit prone to pulling, since the floats on those are longer than the rest of the woven pattern, so take care with those. Solstice: 99% cotton, 1% lurex. 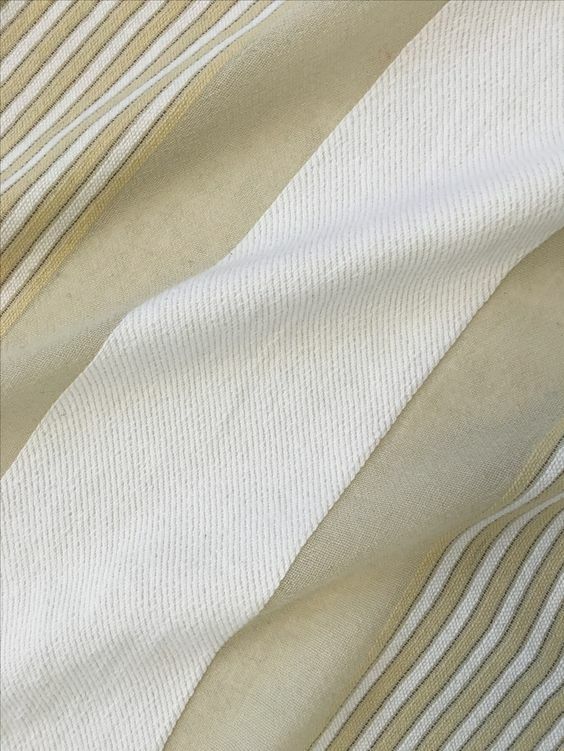 A midweight natural singlecloth with multidimensional large white stripes and hints of gold metallic. As seen on several already-out items: the Slipper Dress in Solstice, the Bronte Top in Solstice, and the Kimono in Solstice. Description: Solstice is single-sided, with varying thickness throughout, similar to Chester and Lunar. Solstice is very sturdy, and not likely to pull. Though it has a tiny bit of metallic, the thin stripes wouldn't be likely to cause irritation. My Thoughts: I'm not a big fan of Solstice. The wide cream stripes are significantly thicker than the rest of the textile, which can make it bend in odd ways in styles with more volume like the Bronte top. Perhaps some ironing would help mitigate that. Overall, the wide swaths of difference thickness make Solstice feel less manageable than Chester and Lunar. It's structured, not drapey, and weighty in a way that is reminiscent of upholstery fabric. I tried all three of the Barneys offerings in this fabric, and none of them were quite right. It's a lovely color and pattern, but I could never get past the structure and upholstery feel. Madras: 98% cotton, 2% metallic. 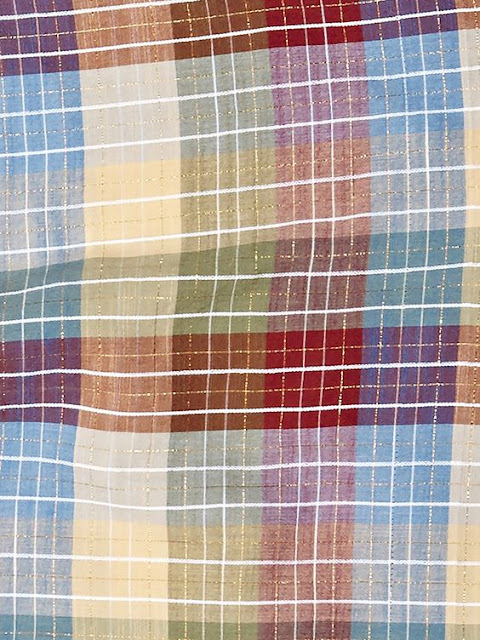 A lightweight singlecloth in a miniature multicolored plaid with hints of gold metallic. As seen on the shoulder of the Barneys XO Bronte Dress in Dune. Description: Madras is a super lightweight textile that would be ideal for hot summer days. It is tightly woven and smooth rather than textured, similar to Crown. It seems very unlikely to pull, and the metallic was thin enough that I didn't not experience any irritation (though my only contact with it were small patches on the shoulders, so I say that with some reservations). My Thoughts: I must admit that Madras is not my cup of tea. There's a palpable 70's vibe to it that feels more retro than vintage, if you know what I mean, and the colors also aren't for me, as I prefer cooler tones (like those in Crown). This one is a pass for me. Lunar: 100% cotton. 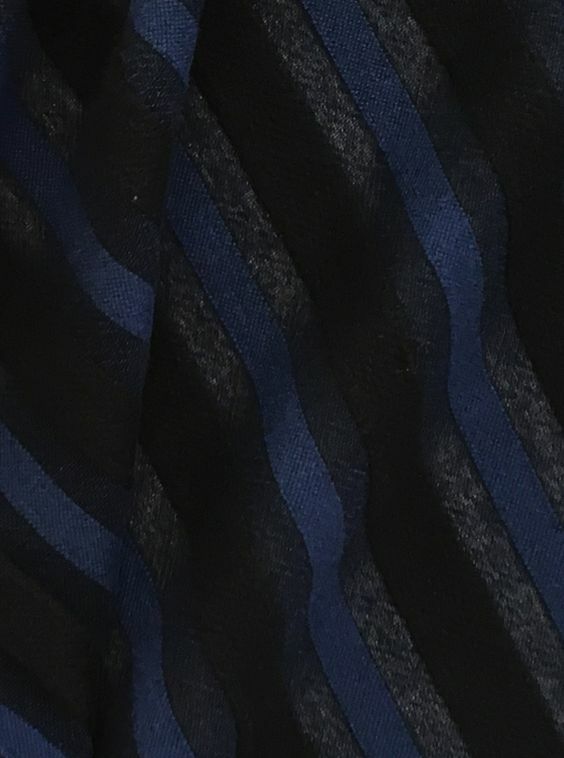 A midweight singlecloth with multidimensional nightshade black and blue stripes. As seen in the Barneys XO Vista Top in Lunar and the Jo Midis which are already out at Barneys. See my try-ons here. Description: Lunar is single-sided and another thick-and-thin textile, like Solstice and Chester from 3rd Drop. Though it appears sheer in some photos (here, here, and here), I didn't find it to be sheer at all in person, as it was a midweight textile. It may have more to do with the bright lights used in photography. 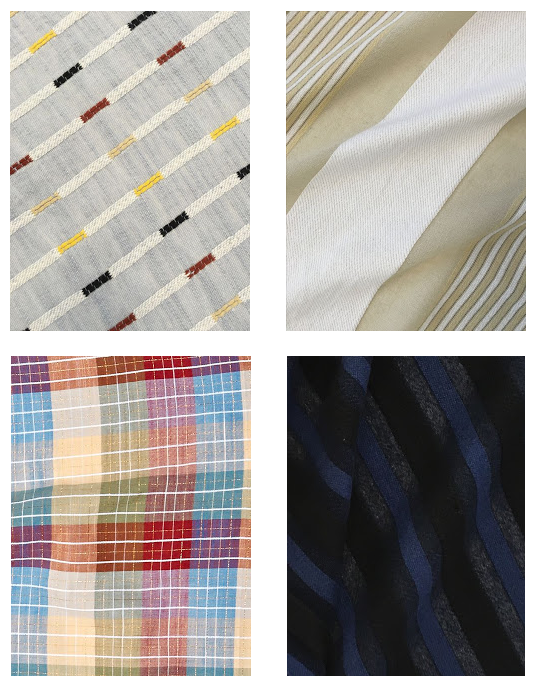 My Thoughts: I personally haven't cared for the thick-and-thin textured fabrics this season, especially as choices for Spring/Summer, as NYC gets quite hot and humid (and most of us don't drive around in cars or live with central a/c all the time). Don't let the photographic sheerness fool you. It's a heavier one for sure. I think it would make a nice Frida Jacket, if those are included in this drop, but otherwise, it's a pass for me. I've felt for a few seasons now that the 4th drop is the weakest of the season. Not bad, but relatively unexciting. This season is no different in this regard. 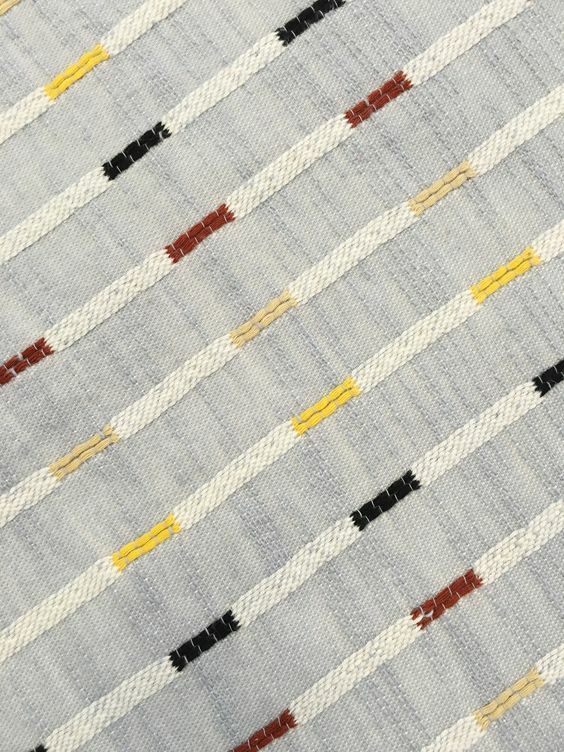 The only textile in this drop that I'm interested in is Ivy, and the only style I've seen so far that I feel like I need is the Teasdale in Ivy. Not that I'm really complaining... it's been a great season, with some new favorite styles and textiles. And maybe a quieter last drop is for the best to ease us into a few months without Ace drops and back into crazy anticipation for what the following season will bring. What do you think about this drop's textiles? Which drop(s) have been your favorite this season?